I like books. There, I’ve said it. For some of you who know me through one of my many publishing endeavors, you might be tempted to read that statement and think duh, of course Steve likes books. He’s in the business. But let me explain. I don’t own a Kindle or a Nook. Further, I’m in no particular rush to get one. Count me as one of those old fogies who live by the axiom, “If it ain’t broke, don’t fix it.” For me, there was never anything wrong with the old version. Handcrafted calligraphy to woodcuts? That was progress. Animal skins to paper? Wonderful. Woodcuts to moveable type? Genius. Moveable type to offset? Marvelous. Offset to digital? Bravo. Paper to silicon? The jury is still out. Hold the phone. The reports of the death of paper books have been greatly exaggerated. According to a recent article in the New York Times, children’s books have failed to gain broad acceptance as e-books. This is because kids love the big colorful pictures, which they can’t get from a tiny black-and-white screen. Further, their parents enjoy the tactile pleasure of snuggling with a child while reading a bedtime story. I get it. 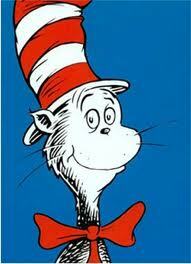 Some of my earliest and fondest memories from childhood are of my mother reading Cat in The Hat, or Where The Wild Things Are. Those vivid illustrations captured my imagination, and motivated me to learn to read. Quality time, education, good habits from a very young age. We’ve all read the obituaries of the famous fabled Borders chain. Hundreds of stores closed, thousands of workers on the streets, shopping malls left with big holes in them. Publishers and landlords were left with piles of unpaid bills. Untold millions in sales taxes will never be collected, draining the coffers of cities and states who need them now more than ever. The sky is falling! Look again. Much of that idle real estate has been quickly taken over by local independents, or by smaller chains such as Books-A-Millon. Monolithic look-alike stores have been replaced by companies that can respond more quickly to local trends and needs. When a local author comes with hat in hand to beg for his book to be featured in their store, no one has to call the home office to ask, “Mother, may I?” The local manager can decide for himself. Think about this like the stock market: Almost every time the Dow Jones sees a meteoric rise, it is almost always followed by a sudden decline. Is this because all of the Dow 40 suddenly went broke? Nope. It’s because the preceding rally had nothing to do with the actual profits or performance of the stocks themselves. A moment of optimism led to a few hours of hysteria, which fed upon itself and triggered frantic buying. Which lifted the prices far beyond their actual value. When the prices (predictably) come back down to earth, the wiser among us don’t call it a crash. They call it a correction. That is, a return to sanity. Which is precisely what it is. 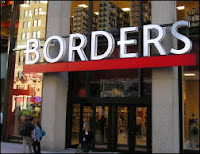 I’m inclined to think that’s exactly what happened with Borders. The stores were beautiful, and everyone loved them. The huge selection, the coffee lounge, the discount club. Who wouldn’t be enchanted by such innovations? The problem was, the business model was never sustainable in the first place. The customers were initially awestruck by the grand spaces, but after a while the stores had just as many looky-loos as buyers. 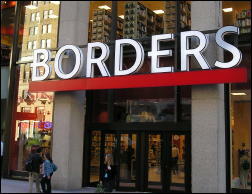 The demise of Borders wasn’t a crash, it was a correction. The only real unknowable, was whether the struggling Barnes & Noble would fold first. The book biz is here to stay. Let's get back to work.